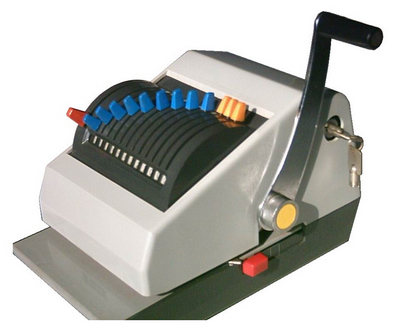 As a special office equipment, the product can write the amount of money on checks and other bills, widely used in banks, financial system, companies and department stores. Main characters of the product are clean write of written number on the front of checks, apparent protruding on the back of checks, anti- counterfeit and alter proof. 1. 10 digital number, 2 decimal number or 12 digital number. 3. Automatic winding and reversing function of ribbon. Can specify banks symbols or any one currency symbol.